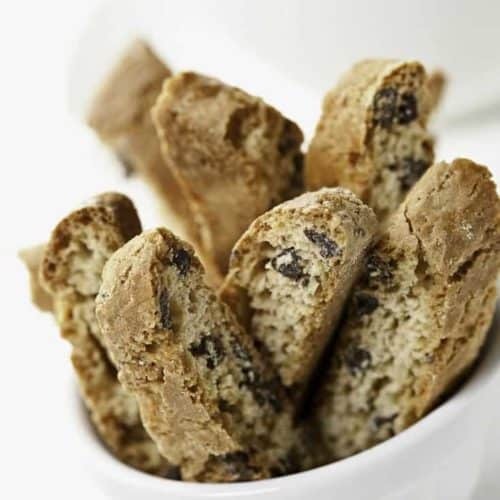 You can make Chocolate Chip Almond Biscotti at home! It is a whole lot cheaper than what it is in the store! These store very well, so you may want to make some for gifts. 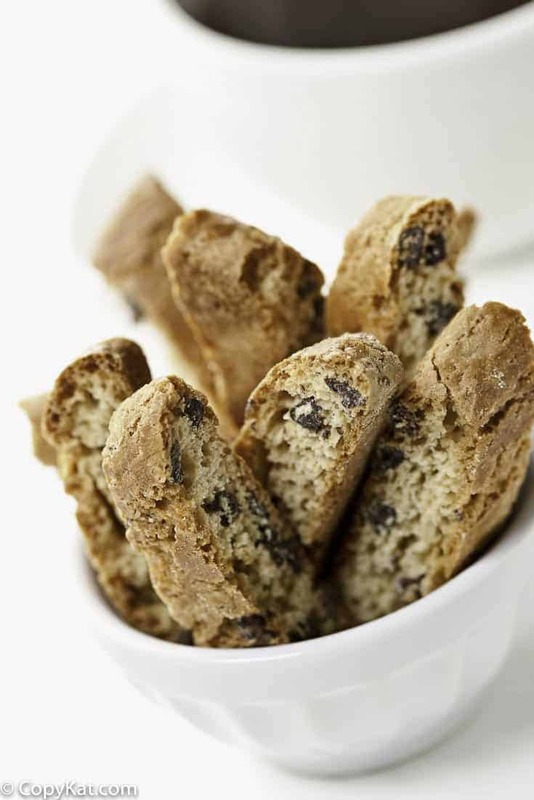 You can make Chocolate Chip Almond Biscotti at home. Preheat oven to 350 degrees. To toast almonds spread on a baking sheet. Bake at 8 to 10 minutes, or until golden brown, stirring frequently. Remove almonds from baking sheet and cool. Coarsely chop almonds to measure 3/4 Cup. Place flour, baking powder and salt in medium bowl; stir to combine. Beat butter and sugar in a large bowl with an electric mixer at medium speed until light and fluffy. Beat in eggs, 1 at a time. Beat in liqueur to extract and add water. Gradually add flour mixture. Beat at low speed, scraping down the side of bowl occasionally. Stir in chips and almonds. Divide dough into fourths. Spread each quarter evenly down center of the waxed paper. Using waxed paper to hold the dough, roll back and forth to form a 15-inch log. Wrap log in plastic wrap. Refrigerate until firm, about 2 hours. Place logs at least 2-inches apart on a greased and floured baking sheet. Bake for 50 minutes or until golden. Cool loaves on a wire rack for 5 minutes. Put loaves on a cutting board and, with a serrated knife, slice at a 45° angle into 1/2-inch-thick slices. Lay flat on the prepared baking sheet and bake until golden and hard, about 20 to 25 minutes, turning them once. Store in an airtight container. So far this sounds good….but what do I do after I roll it into a log???? We should be good now 😉 I had to check my notes on this one.